Select your ideal shower doors from our vast selection of glass, finish, and style options. 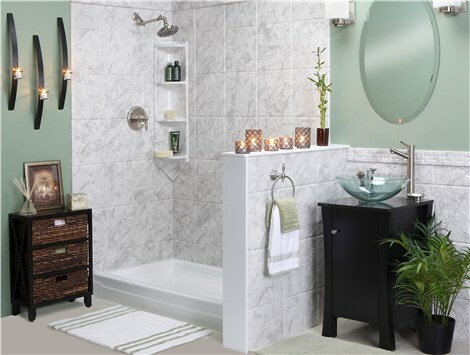 Even the most efficient shower can seem incomplete if its doors are grimy, broken, or outdated. At Bath Planet of West Texas, we offer replacement shower doors in Lubbock and the surrounding region that can enhance the beauty and functionality of any size bathroom—at an affordable price! Whether you want modern, clear glass shower doors or the high-end finish of polished chrome, we have the region’s largest selection of top-quality products to meet your needs. Door Style: Choose from the traditional look of standard bypass sliders, the modern appeal of stylish S-curve bypass doors, or swing doors when updating your bathroom. Finishes: Every homeowner has a unique vision for their bathroom, and we offer shower doors in brushed nickel, oil-rubbed bronze, polished chrome or gold, satin chrome, and white to complement your space. Glass Design: New shower doors offer both privacy and visual appeal, and we can design your doors with clear, glue chip, rain, or obscure glass to give you the look and functionality that you’re searching for in the bathroom. The showers offered by Bath Planet of West Texas are designed to give you the efficiency, accessibility, and function you need in your bathroom without having to sacrifice on style and quality! From start to finish, our skilled team will work with you to design the Lubbock shower doors you’ve been dreaming of to put the perfect finishing touch on your remodel. When you’re ready to learn more about how we can enhance your bath with replacement shower doors in West Texas, just give us a call! You can also fill out our online form now, and one of our bath specialists will be in touch to get you set up with a free, no-obligation estimate.